The Office of Student Conduct launched a new initative in Fall 2018 to recruit and train MIT community members to become volunteer advisors for students referred to the Committee on Discipline. Advisors attend a half-day training to learn about the COD process, how to support students, and how to deal with potential challenges and issues advisees may face throughout the process. The first cohort of OSC Advisors has now been trained and is ready to work with students in need! 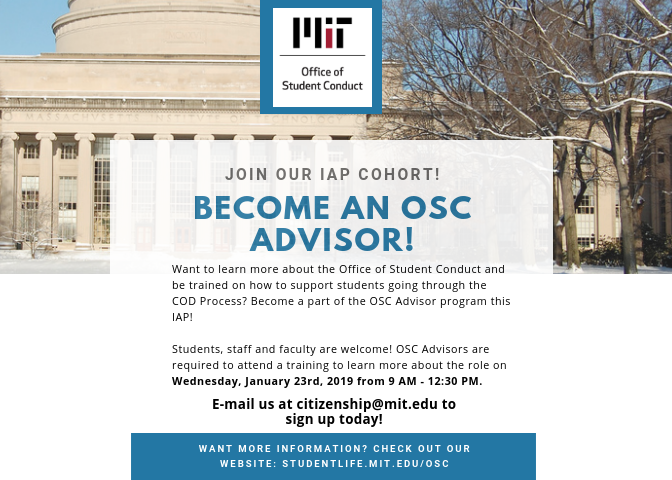 Please reach out to the Office of Student Conduct via email (osc-staff@mit.edu) if you are going through the process and would like to be connected to one of our OSC Advisors. Students who request help from OSC with finding an advisor will be connected to a trained member of the program that is available to provide personal and logistical support throughout the process. For those interested in what the role of the advisor in the COD process looks like, more information can be found on our page on advisors.